What makes the SCGS Jamboree so special? For me it is DNA day and all the attention paid to DNA at a first rate local genealogy conference. Of course we genetic genealogists also have the I4gg conference, which is returning to San Diego this coming December 9-10. This year at Jamboree I made sure to go to presentations from the two newest DNA testing companies: MyHeritage (the European answer to ancestry.com) and LivingDNA. I also visited their booths and talked with both groups. I also enjoyed finally meeting DNA expert Debbie Kennett and listening to her talk (both the lovely British accent and the presentations). 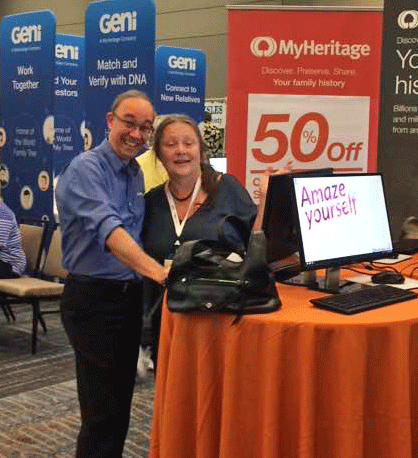 Daniel Horowitz made a convincing case for the future DNA features at MyHeritage (chromosome browser, family tree matching, etc), so yes get your DNA results uploaded there while it is still free! If your recent ancestors are not from North America, it might make sense to use that site for your tree and DNA testing. Plus the test is a cheek swab which is easier for old folk. Yes, GEDmatch takes uploads of the DNA results from MyHeritage and I just saw my first kit starting with an H in a one-to-many. On the other hand, if you have British roots, LivingDNA may be the test for you and it is also a cheek swab. They have built on the academic research for the people of the British Isles, so can pinpoint the areas of Britain and Ireland that your ancestors came from. They are gathering more data from other countries but currently my Norwegian and German ancestors seem to have a large presence on the British and Irish coasts (think vikings and Saxons) but I will save those results are for a future blog post. Here is a quote from their website: “Living DNA is a collaboration of over 100 world-leading scientists, academic researchers and genetic experts.” Particularly compelling is their anti-racism campaign or how DNA testing school kids is making such a difference in Europe. Of interest to genetic genealogists is that they are using a new chip which tests far more SNPs. The new GEDmatch beta site “Genesis” takes uploads from LivingDNA so those results can be soon used for cousin matching and the other tools there. Plus the live streamed talks can be viewed for free for the next few weeks, click here for the how to on Thomas MacEntee’s site Genealogy Bargains. Thanks to all the wonderful speakers and particular thanks to the many volunteers who make the Southern California Genealogical Society Jamboree happen every year! 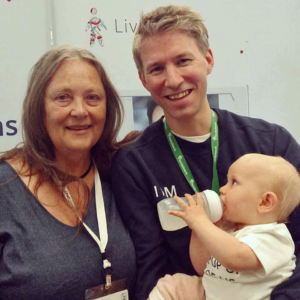 I just got my LivingDNA kit yesterday & realized, I haven’t taken it yet. I meant to do it as soon as I woke up. I’ll do that in an hour or so. I also got the results of MyHeritage on Monday although I uploaded to them plus nearly all of my relatives. MyHeritage seems to be pretty accurate with my ancestry results minus the fact that they did away with my European, same for others who are both Polynesian and European background. I was looking into a subscription but based on what your Jamboree roommate told me, I decided not to. At least not for now. I did like their matching where they showed percentages, total shared in centimorgans, number of segments and the largest segment size, all very useful! I’m anxious to see the area LivingDNA maps out for me. Thank you for providing the link for the archived SCGS Jamboree talks!